Over the years we have experienced our own life-changing illness and events as well as many from friends, family members and members of our church families. It isn't something anyone asked to deal but these illness do become the trials we must face in this lifetime. 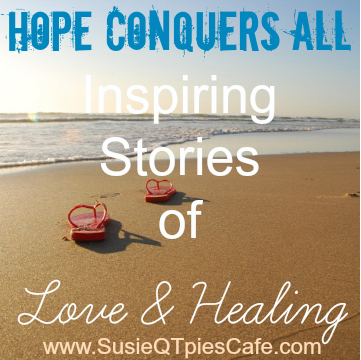 Through all of these trials we learn to love and share many healing stories and that hope conquers all. Have you experienced a life-changing illness or event? Where did you turn for support? I participated in a campaign on behalf of Mom Central Consulting for CaringBridge. I received a promotional item as a thank you for participating. One resource that has been around for over 15 years is the nonprofit CaringBridge organization. This organization has served as a lifeline of hope which has brought together families who are struggling with illnesses and tragedies. 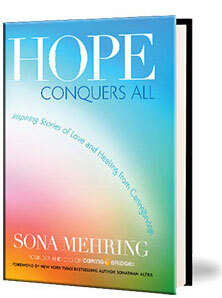 Sona Mehring, founder of CaringBridge put together a book, Hope Conquers All, to share a collection of stories which inspires hope for those who are struggling because they are stories from those who have struggled. The book includes real personal journeys from young children with cancer to adults awaiting transplants. The stories are uplifting tales for those who are in need of love and support and gives encouragement to those struggling. Click to read more information or to purchase Hope Conquers All for you or a loved one. All proceeds from the book go to CaringBridge. We've had a lot of friends who have used CaringBridge over the years for friends with cancer, organ transplants, preemie baby issues and other life changing medical issues. Their website kept us connected to those who were sick no matter how far they were from us. It is truly an amazing resources for those who are struggling with life-changing illness and events. Do you have any experience with CaringBridge? Where has your family turned to in time like this? Please share in the comments below.